Avoid touching the surface of a pastel, this will damage the artwork. If your artwork was painted or drawn using soft pastels (the most common form of pastel), the artwork can be readily smudged or blended if you touch the surface. Finished artwork requires protection, either by framing under glass or the use of a fixative spray. Before your pastel is framed, use glassine or wax paper to transport or store the artwork. Wrap the artwork with the paper and affix to the back specifically using artist or drafting tape so that it will not be permanently stuck. This keeps the glassine from sliding around and will keep any loose particles from moving around. It's even better if you can lift the protective covering with spacers or risers along the outside edges so that nothing comes into contact with the artwork. The only difference between framing a pastel versus an oil painting is glass. Pastels need the protection of glass to prevent dust, pollution or any tiny insects from soiling or damaging the artwork. You should ask the artist about fixative before you use it on a purchased piece. Artists who work in soft pastel may choose to spray their work with a fixative, however many pastelists choose not to use fixative. This is because pastel is a dry medium and they want to keep it dry, enough though the spray drys quickly. Also fixatives are known to darken the colors, darken the values or could disturb the subtle textures of the pastel pigments. If you are going to spray, use SpectraFix it's all natural and does little or no damage. Spray the artwork from at least 2 feet away and make sure to spray it while it is vertical i.e. propped up against a wall. This is so the larger drops of spray fall to the ground and don't damage the artwork. Glass may create a glare on the artwork. This comes from a strongly polarized light which creates a region of intense illumination around the source. These hot spots may obscure the view of parts of the artwork. A non-reflective glass is recommended to minimize glare created from glass. Non-reflective glass is more expensive but there are different type of non-reflective glass. Depending on how reflective the glass is, directly correlates with the price of the glass, i.e. Museum quality non-reflective glass is the top of the line. When selecting the glass for your pastel, you should consider an Ultra-Violet (UV) protective glass that will provide protection against any bright lights over the years to come. Plexi-glass is recommended for shipping larger pastels especially if they are shipped over long distances. Plexi-glass will not break or shatter if dropped by the shipping service. I is also lighter. Plexi-glass may also have UV protection or non glare properties, just like regular glass. If using plexi-glass, you must first treat it with spray-on or a similar anti-static spray to neutralize the static electricity which prevents pieces of pastel from clinging to the plastic. When framing your pastel, do not use acrylic sheets as a glass substitute. Acrylic sheets become statically charged and will act like a magnet to the pastel particles, therefore lifting dust from the artwork or creating loose dust within the frame. Also if the pastel is a larger size, thinner sheets of acrylic will bow and eventually come into unwanted contact with the artwork. Make sure that the pastel does not touch the glass. This will keep the artwork intact, if the glass is broken and protect the artwork from smudging. Allow at least a .125 inch space between the surface of the artwork and the inner side of the glass pane using a spacer or a mat. Spacers are used for those that want the appearance of an traditional oil painting. Spacers are sold online or at most framing stores. A mat may also serve as a spacer, however double or triple matting work is recommended, as there needs to be a sufficient gap between glass and artwork. 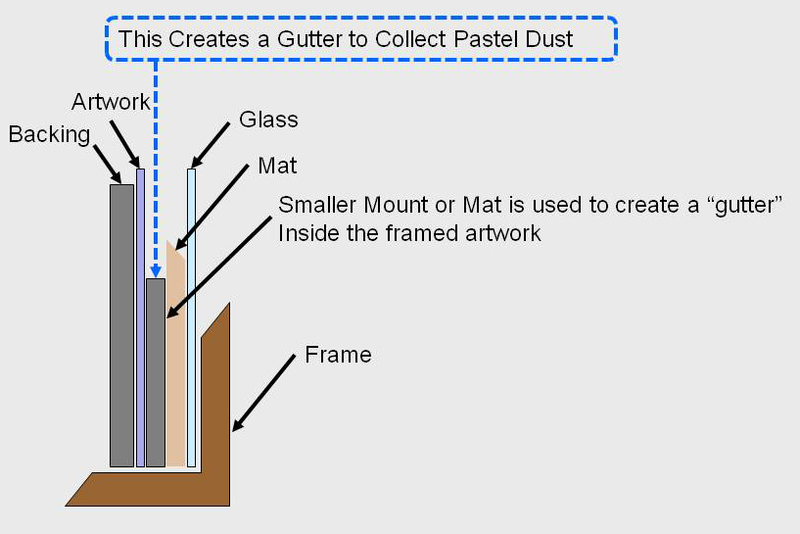 A small amount of pastel dust is unavoidable and the best way to prevent this from ruining your framing job is to create a "gutter" where dust may fall and settle out of sight. Some pastel papers are sturdy enough to be framed without a backing board or back mat, if the artwork is on paper that is not heavy weight then it is recommended to attach it to a backing board. This will keep the artwork from slipping or moving after it has been framed. It is recommended to use archival or acid free boards for mounting the artwork, it is less likely to discolor the artwork over time. A Water activated adhesive may be used to hinge the artwork to a backing board, it is safe, water reversible and acid-free. Linen tape may also be used which is usually archival as well. Lineco makes archival quality water activated or gummed adhesives that may be purchase through a frame shop or online. 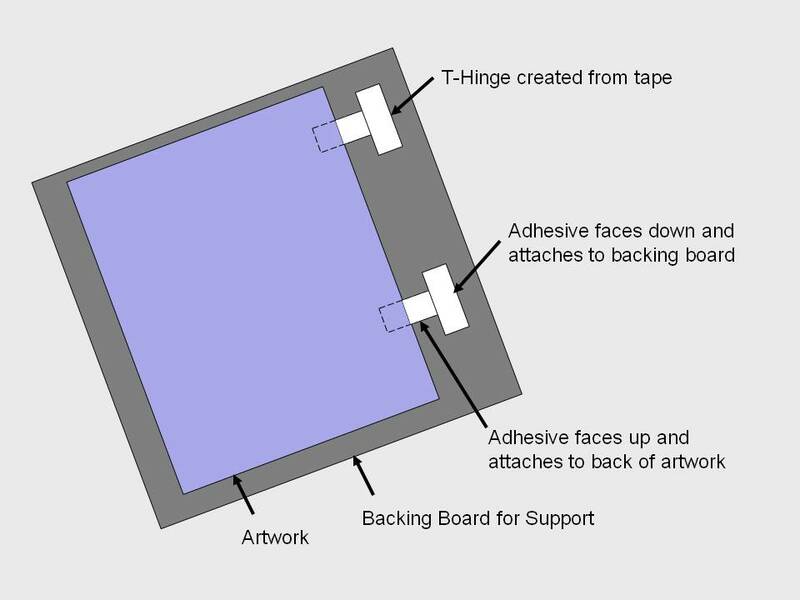 When attaching the artwork to a backing board, use a "T-Hinge" or "V-Hinge" as shown below. Either hinge will protect the front of the artwork from coming into contact with an adhesive. Black Tyvek® material is recommended to use for dust covers on pastels. It is a tear and water resistant picture frame backing paper made from 100% DuPont™ Tyvek®. Wiring Your Artwork "Ready to Hang"
Avoid hanging any original artwork in direct sunlight, this may cause the pigment to fade over time. To avoid any loose dust particles falling on to the mat or glass, never turn a framed pastel upside down or face down. 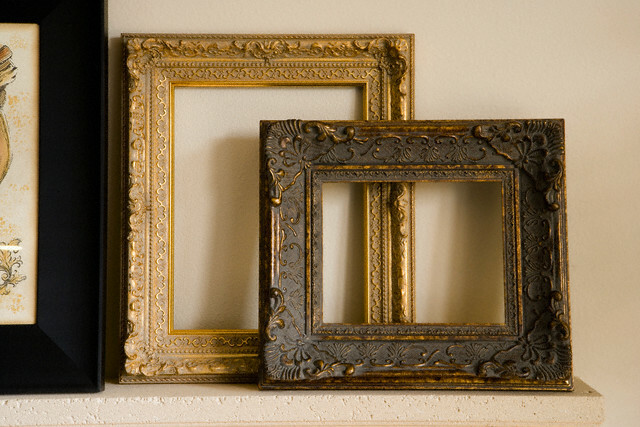 Ready made frames are pre-built picture frames. You can find the following standard sizes in most ready made frames. Acid - A chemical substance that has a pH of less than 7.0. Acids can react with photographs, paper memorabilia, metals, and scrapbook products shortening their life span, causing corrosion, discoloration, brittleness or a variety of other problems. Acid Free - Materials treated to neutralize the natural acidity These materials have a 7 pH or very close to 7 pH. Acid-free materials are more permanent and less likely to discolor over time and are recommended for framing fine art. Backing - A sheet of mat-board or foam core placed behind the artwork and it's associated mat to provide stiffening and protection. Beveled Edge - A 45-degree cut on a mat board. This allows about 1/16" of the core to be seen. A reverse bevel means the core will not be seen from the front of the mat. 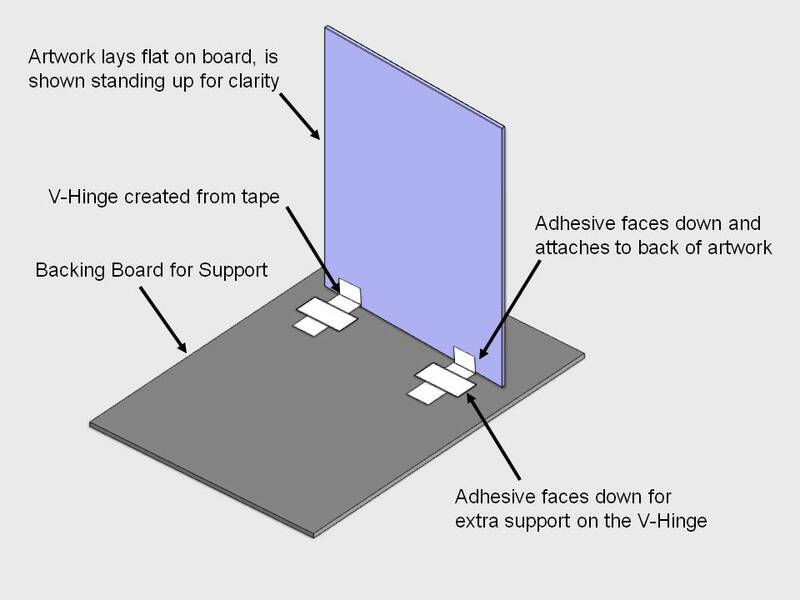 Bumpers or Pads - Felt or plastic that attaches to the bottom corners of the frame. They keep the artwork straight on the wall and will keep the frame from scaring the wall over time. Conservation, Conservation Framing - Procedure where all materials that come in contact with the artwork; mat board, mounting board, etc, are completely acid-free, designed to minimize the deterioration of the artwork caused by exposure to the environment. Double Mat - A technique where the artwork is matted using two separate mat boards, one on top of the other. Dust Cover - Paper or water resistant material used to keep insects and moisture from the artwork over time. Frame - is the outer board an an important decorative element, choose carefully. It will affect the value scale in the piece. It also holds the framing package together so it should be sturdy, in good condition and undamaged however the only job of the frame is to make the artwork look good. Glass or Glazing - is a transparent sheet of glass that is placed within the rabbit of the picture frame. It provides a protective cover for the artwork in the frame. Certain brands of glass offer protection from UV rays which will prevent color fading effects from sunlight or fluorescent. Use ammonia-free spray cleaner and a lint-free cloth or paper towels for cleaning glass and always use whit cotton gloves to keep from adding more fingerprints when handling. Matboard - provides separation between the work of art and the glass that protects it. Another option is to use a spacer that will raise the glass above the art. Top quality matboard is called 'Rag' because it is made from 100% cotton. Rabbet - The width and depth inside a frame that fits over the glazing, mat, artwork, and backing material. 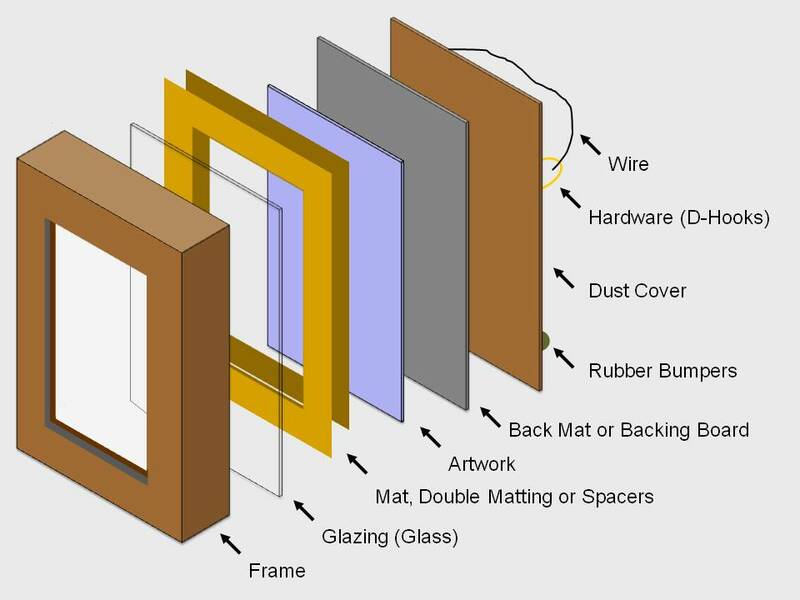 Spacers - When matting is not used use a spacer to separate the glazing or glass from the art. Spacers may also be used with matting. They allow loose pastel dust to fall down behind the mat or mats so that the mat remains clean and free from dust. Touch Up Markers - used to cover small scars on the frame. Made in all different colors and shades of wood. Wire - used to hang the artwork on the wall. Should be secured in place with "D-ring" hardware. It comes in all different sizes. 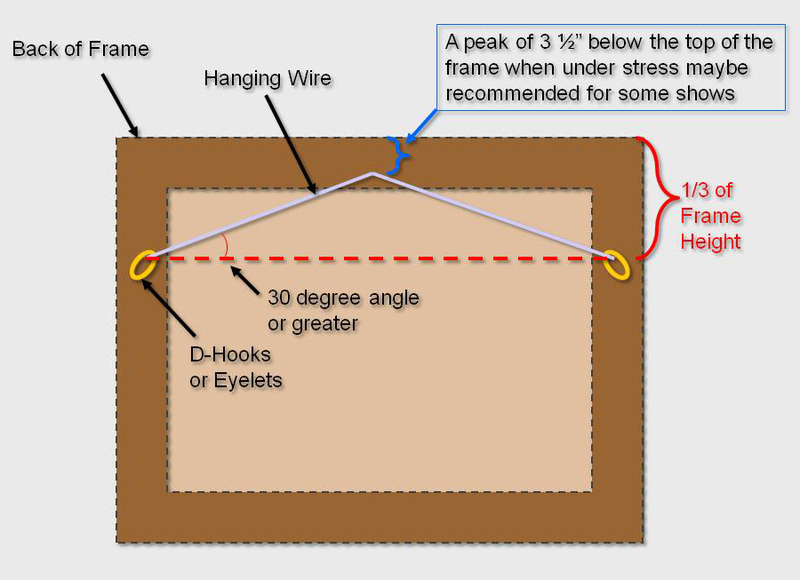 The most common is braided steel wire however framers prefer plastic coated wire and it looks more professional.